Leave the garlic unpeeled and fry it with a little oil in a pan. Add the sieved organic datterini tomatoes with white truffle “Il pregiato” Petti, almost all the green olives in pieces and almost all the crushed chives. Cook for about 10 minutes. 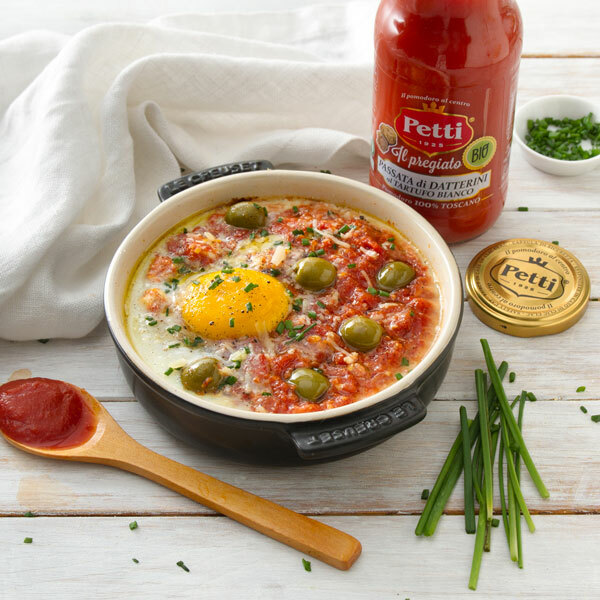 In the meantime oil 4 cast-iron casseroles, put in three or four tablespoons of sauce, break the eggs inside, add one tablespoon of sauce and garnish with a few pieces of olive and chives. Bake the cocottes at 180 ° for 2 minutes until the egg albumen becomes white and serve as soon as you turn it off.